Registration for the 2018 CORSA International Convention in Pittsburgh is now open for members. To register, members should log onto the CORSA website and navigate to the Registration page. 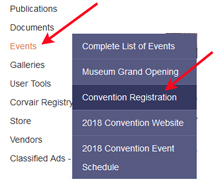 You can also navigate to the convention website and a complete convention event schedule from the menu. For Convenience, you can click here to open a pdf of the complete convention event schedule. Not a member? Now is a great time to register and participate in all the Convention fun. To Join CORSA, click here. Buying Stuff From Venders - Every day! FYI, The paper registration in the April communique states that the Pirate Baseball Game is Friday, It is THURSDAY!